Almost 250 Chicago Public Schools teachers and staff are out of work after losing their jobs Monday. Schools officials say the layoffs are a result of a decline in enrollment this school year. By law, the layoff notices have to go out Monday because it's the 20th day of the school year, but the enrollment numbers they're based on are from the 10th day of enrollment. A week ago, the district released those numbers, showing a 3.5-percent decline in enrollment–that's 13,800 students. So on Monday, the district cut a total of 140 teachers, and 109 support personnel at those schools where enrollment fell. Last week the district predicted that the lowered enrollment numbers would mean less money for schools, and therefore up to 300 layoffs. The actual number ended up being less than that Monday, again, because many principals tell me they've held off on spending or filling vacant positions, so they wouldn't have to make these cuts. “Once again, principals have done admirable work in helping to protect classrooms and students' progress, and we're grateful for the work they did planning and preparing for the year. This is somewhat similar to what principals have done in the past, scrimping and saving elsewhere to avoid trimming positions. One principal told me it meant no new athletic uniforms or band instruments, or no overtime pay for professional teacher development and planning time. The news comes as the district is still negotiating its contract with the Chicago Teachers Union in order to avoid a strike next week. Of the 250 employees laid off, 187 of them are CTU members. The union says the cuts and the layoffs have been adding up, especially in the last year. You'll recall there were about 1,000 layoffs in August, because of positions being closed, and back in the winter, there were a handful of layoffs, about 62. The union says it all adds up to about 1,500 layoffs since CPS CEO Forrest Claypool took over. “School budgets are down more than 6 percent this year–a loss of $184 million–on top of years of sacrifice by our students, educators and schools, amounting to more than $2 billion in give backs. In each case, the district has said those teachers being laid off are eligible for other vacant positions in CPS, and Monday, the district said there are a total of 628 teaching and support staff positions open around the district. 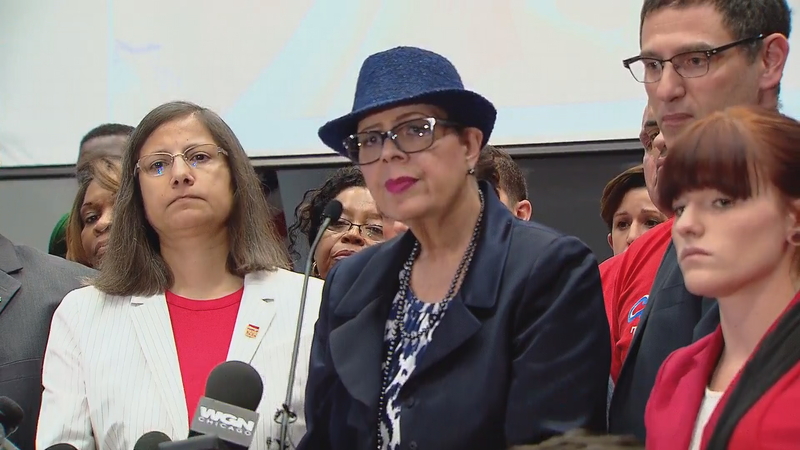 The district and CTU met three days last week, and they're scheduled to meet three days this week in efforts to resolve a contract. Meanwhile, CTU says it’s moving ahead with strike plans, just in case. The House of Delegates meets this Wednesday to discuss contract negotiations and logistics for a strike. CPS will announce its contingency plans later this week as well. Oct. 3: The YMCA and other community organizations across the city plan to hold strike camps for CPS students if the district and Chicago teachers can't reach a contract agreement by next week. Sept. 29: Chicago teachers formally give a 10-day strike notice to the Chicago Board of Education. Why the mayor and schools chief think they can avoid a walkout. Sept. 28: The CTU plans to serve CPS its 10-day strike notice Thursday for a possible Oct. 11 walkout. We hear more about the plan from CTU Vice President Jesse Sharkey.